You do not have to spend expensively when decorating your home. Simply choose a decor that fits your budget and add coordinates as your budget grows. 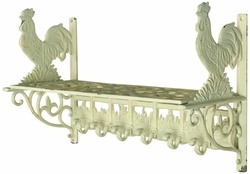 This wall shelf with coat hooks offers tons of country charm. It's the perfect spot hats, umbrellas, jackets and more. A weathered painted white finish offers warm appeal. Great for kitchens and entryways.